Zombie Hunter, which was once slated to be released in the US as Zombie Master, is a scrolling hack and slash adventure. It’s like Zelda II in a way, except Link has a shield that he can actually use, instead of just adding to his total defense rating like in Zombie Hunter. Having a functional shield would’ve made this game a LOT more tolerable, I imagine. Anyways you walk to the right and slash at various foes that appear. Eventually you get enough experience to level up, and you also get gold sometimes, and items even less of the time. Like, you can get Food that (thank God) restores your HP, or maybe you’ll get more powerful weapons or equipment, or maybe the key that unlocks the last door that lets you finish the level. 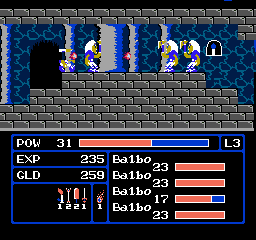 The enemies don’t seem to do any damage by themselves (you can jump on them for much amusement), but they can all fire projectiles that hurt quite a bit. Why your shield is, again, useless for deflecting projectiles, is just a bit annoying. Everything’s translated except for that voice that chastises you whenever you die. Which happens a lot. Yeah, the game has synthesized voices in a couple places. It’s pretty kewl. Another fine translation for an extremely mediocre RPG. 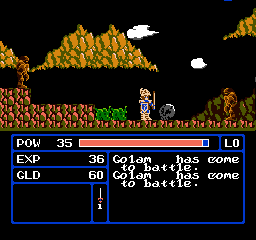 I can’t say that I really can recommend this game to anybody but hard-core oldschool RPG enthusiasts like myself. It certainly scratched an OCD leveling itch for a few hours, but other than that, there’s not much on offer here that isn’t done better in other titles. Graphics are ugly, controls are loose, and everything is based off of a very simple RNG scheme. Also, while the game starts off pretty easy, especially if you grind for a bit in the beginning and make sure you always have a healthy stock of food, it gets pretty insanely hard towards the end if you didn’t luck into some great defensive and offensive weapon drops (which I didn’t) and your levels are maxed out (which mine were). 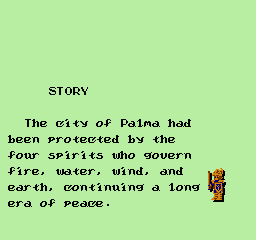 I probably would have spent some time grinding for better item drops while hanging out by shops where I could buy medicine, but I just couldn’t wait to finish the game because of an extremely annoying bug that cropped up when I hit level 31. That’s the maximum level, and the maximum experience points are 13,000. Unlike the Ys games which top out at (I think) 65,256 experience, 13,000 is the max here and it keeps right on counting up. Because of this, you “gain a level” every battle you fight for the rest of the game. Your stats don’t actually increase any further, but it pauses the game to show you the max stats and gained level now every battle you fight until you either die or beat the game. I’m assuming this bug was in the original coding because of the choice of 13,000 exp as the max, and it’s not a result of the translation. Not sure if the hackers/translators here would be able to “fix” this glitch or not, or even if it would be worth the effort, but it would make this game more playable. I’m still going to recommend this, like I have all of my game translation reviews. There definitely is an audience for these titles and this work, even when the games are just a step above garbage and it’s obvious why they didn’t get an official translation, like what we have here. 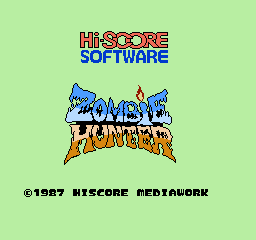 NOTE: It should be noted that I use an emulator without save states, and Zombie Hunter doesn’t have any in-game save feature or password system. I had a real “fear” that I was going to die late in the game and waste all that time playing when enemies started spanking me because of my bad item drops. (Level 2 sword from the first level was all I had, and still rocking level 2 armor as well, after a TON of grinding to max out levels). If you’re one of the masochists that play these types of games and you make it this far, just get to the sixth level, max out on medicine from the shops and use them liberally as you trek to the right. The last boss is easy by comparison.